I've never been a huge fan of ancillary Star Trek crews, and some aspects of Star Trek: Starfleet Academy are predictably formulaic. 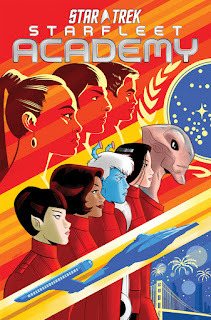 But despite my initial misgivings, Starfleet Academy is charming fun, and an impressive demonstration of Star Trek tonal range by IDW Trek writer Mike Johnson (with Ryan Parrott). Derek Charm's animated art style marks an immediate departure from the realism of Tony Shasteen and others. Like Gotham Academy is for Batman, Starfleet Academy tells a cogent Star Trek story, but with a softer approach that might appeal to a wider audience (and an emphasis too, for the most part, on strong female characters). Johnson and Parrott take the opportunity here as well to introduce some stylings of another Star Trek franchise to the nuTrek comics universe. Academy tells parallel stories of Nyota Uhura, in her just-pre-Star Trek movie cadet days, trying to solve the mystery of a quarantined planetary system and a transmission classified by Starfleet, and a team of Starfleet cadets in the "now" (just before Star Trek Beyond) participating in a Federation school competition who run afoul of that system. That the first nuTrek movie included Academy content conveniently allows for the telling of Academy stories with the Enterprise crew that feel relatively modern, and Johnson and Parrott cleverly weave in Kirk, Spock, McCoy, and Chekov without violating any of the characters' established first meetings. 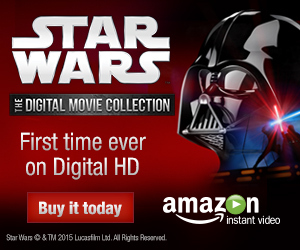 The story unfolds for the most part in predictable Star Trek fashion. The main Academy character, T'Laan, is a Vulcan who feels she must leave the Academy to go live on New Vulcan; her professor challenges her to participate in the competition first and then she can leave if she still wants to. We know at the outset that T'Laan won't ultimately decide to leave, just as we know the Vulcan will come to appreciate her fellow cadets' emotions just a bit before the end. The rest of T'Laan's team has certain foibles perhaps common to the young adult genre -- overconfidence, lack of confidence in themselves, trying too hard to please domineering parents -- that again we know they'll overcome by the finish. But Johnson and Parrott do well to make these characters lovable (with help from Charm's bubbly art), and the sarcastic, effervescent Lucia Gonzales especially shines. Accepting the conceit that these are cadets, they're able to poke at one another, good-naturedly, in a greater way than the original Star Trek or Next Generation characters could, which is refreshing. And the Monchezkin Ven K'Bentayr's manner of speaking aloud everything he sees works to hilarious effect. The mystery of the Wagner-219 system ramps up in the third chapter (after some great Kirk/Uhura hijinks and a funny dance party sequence in the second) when Johnson and Parrott flash back to a Star Trek: Enterprise-era ship. Though neither Jonathan Archer nor the earlier Enterprise appear, and I have no idea if this is the first use of Star Trek: Enterprise in Johnson's Star Trek comics or not, the story uses Enterprise-style ships and uniforms, and so there's a definite "crossover" feel to the story that heightened the appeal of the mystery for me (I was reminded, in a sense, of Enterprise's role in the Star Trek: Destiny novel crossover). Underpinning all of this is a storyline about Uhura and Spock's relationship, or rather cadet Uhura dealing with graduate student Spock putting their relationship on hold for fear of being accused of fraternizing with a student. Uhura and Spock's relationship is one of the better nuTrek changes and the romantic storyline contributes to the story's "young adult" feel; also Johnson and Parrott highlight Uhura and Kirk's friendship well as the two sneak through the bowels of Starfleet Academy. I only didn't like that Uhura is ultimately saved from expulsion from Starfleet through Spock's intervention; there was maybe no way around it, but for a story that puts at the forefront Uhura, T'Lann, Lucia, and cadet Grace Chen, it seemed out of place that one of Uhura's male counterparts would have to step in and save the day. Though the writers of course had to bring past and present together, it was never clear why Uhura, finally understanding the reason for Starfleet classifying Wagner-219, would still hide a message about the mystery that T'Laan would later find. In the end, however, Star Trek: Starfleet Academy is a cheerful romp, one that uses science-fiction concepts well but that differentiates itself from other Star Trek comics through Derek Charm's cartoon-inspired art. Mike Johnson and Ryan Parrott's story plays to familiar elements of the genre of the tale they're trying to tell, which might very well be the right decision for the first outing. Again, I'm not much a fan of "disconnected" crews (New Frontier notwithstanding), but I'd be happy to see what the writers do with these characters in a second miniseries or the new Star Trek: Boldly Go series.